The substitute phoneme th replaces [the phoneme h 31 of the verbal stem] āh- (substitute for brū- 3.4.84) [before 1.1.66 a non-nasal consonant 26]. Source: From Aṣṭādhyāyī of Pāṇini In Roman Transliteration translated by Sumitra M. Katre, Copyright © 1987. Courtesy of the University of Texas Press. āho hakārasya thakārādeśo bhavati jhali parataḥ. idamāttha. kimāttha. ādeśāntarakaraṇaṃ jhaṣastathordho 'dhaḥ 8-2-40 ityasya nivṛttyartham. jhali ityeva, āha, āhatuḥ, āhuḥ. hṛgrahorbhaśchandasi hasyeti vaktavyam. gardabhena sambharati. grabhītā. jabhrire. udgrābhaṃ ca nigrābhaṃ ca brahma devā avīvṛdhan. 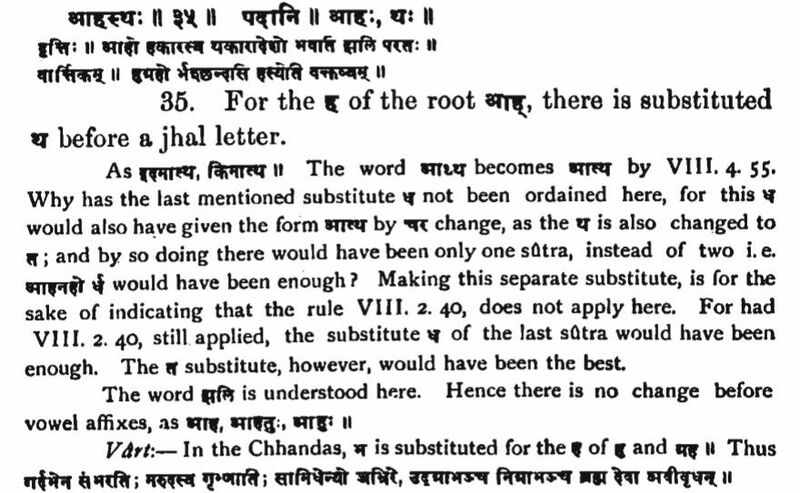 āhasthaḥ 8.2.35 āho hakārasya thakārādeśo bhavati jhali parataḥ. idamāttha. kimāttha. ādeśāntarakaraṇaṃ jhaṣastathordho 'dhaḥ 8.2.40 ityasya nivṛttyartham. jhali ityeva, āha, āhatuḥ, āhuḥ. hṛgrahorbhaśchandasi hasyeti vaktavyam. gardabhena sambharati. grabhītā. jabhrire. udgrābhaṃ ca nigrābhaṃ ca brahma devā avīvṛdhan.